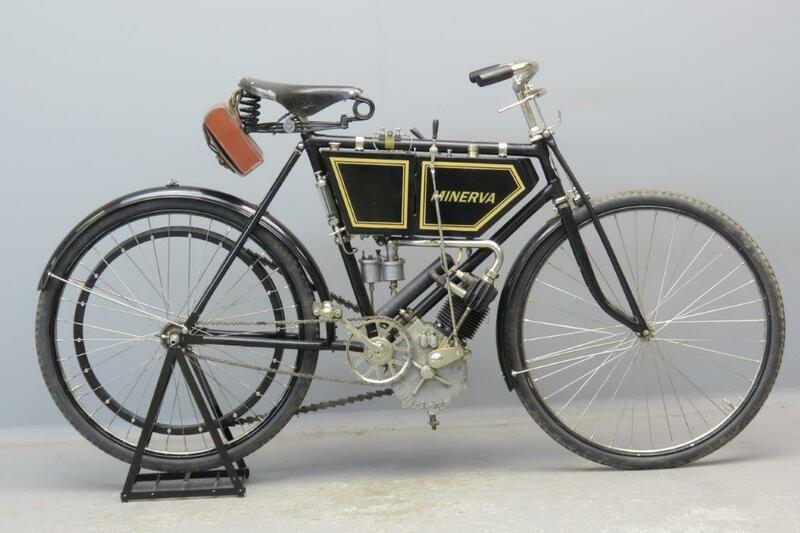 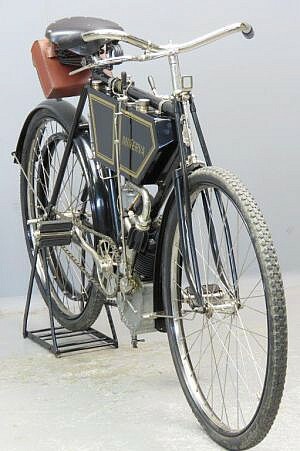 Prior to the Great War, Minerva became quite famous for its range of motorcycles with ¾ HP to 8HP motors. These engines were also supplied to over 100 other manufacturers of motorcycles and motorized bicycles, and were licenced for manufacture in other countries. 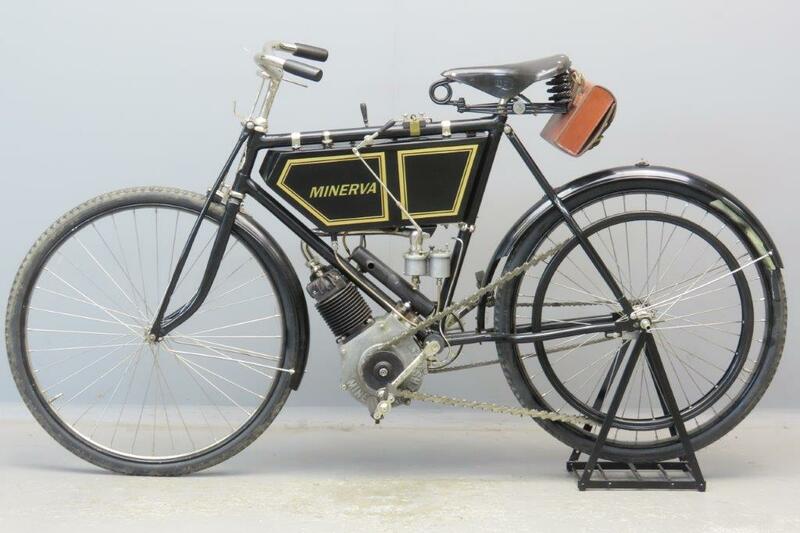 The factory ceased production of motorcycles in 1908/1909 in favour of high quality cars which competed with the likes of Rolls- Royce and Hispano-Suiza with clients in wealthy and influential circles. 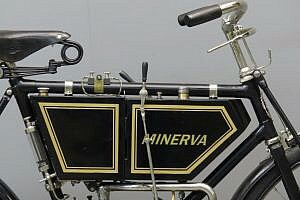 In total, some 35,000 Minerva motorcycles were built in the Belgian factory. 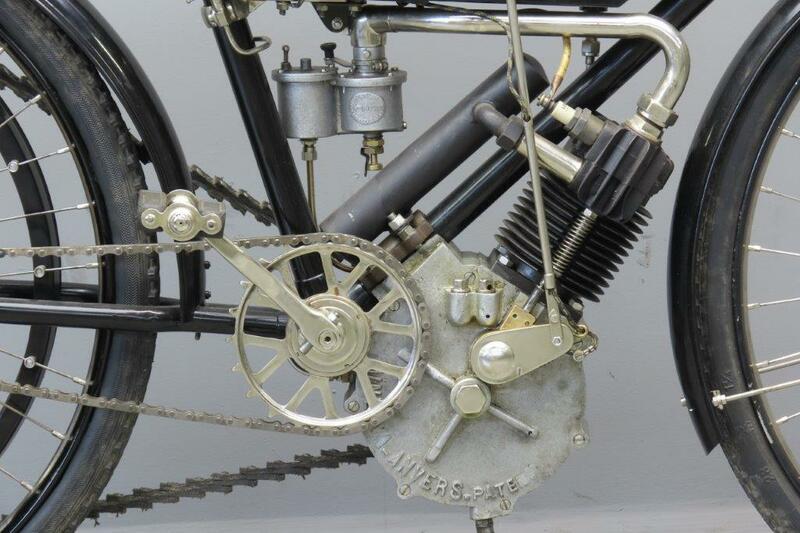 The company was declared bankrupt in 1934, and was taken over by Imperia of Belgium which made vehicles during WWII. 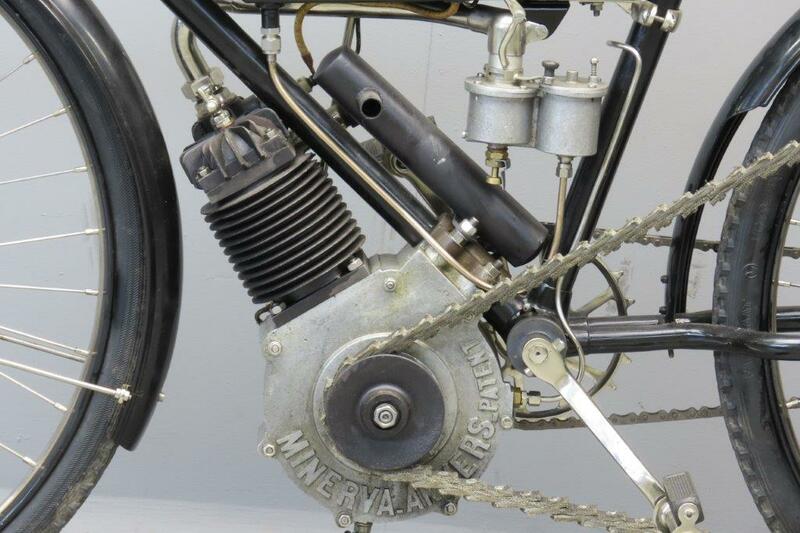 A revival of the company was attempted in 1953 or 1954 with the production of scooters under licence from MV Agusta, but this failed and the factory went into final liquidation in 1958. 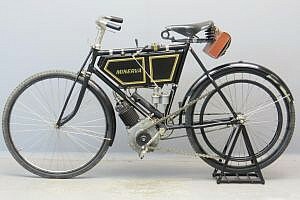 The 1902 range comprised no less than 4 engine types, ranging from a 1½ HP 211 cc (62×70) light model to a 2 ½ HP (75 x 75) 331 cc “heavyweight”. 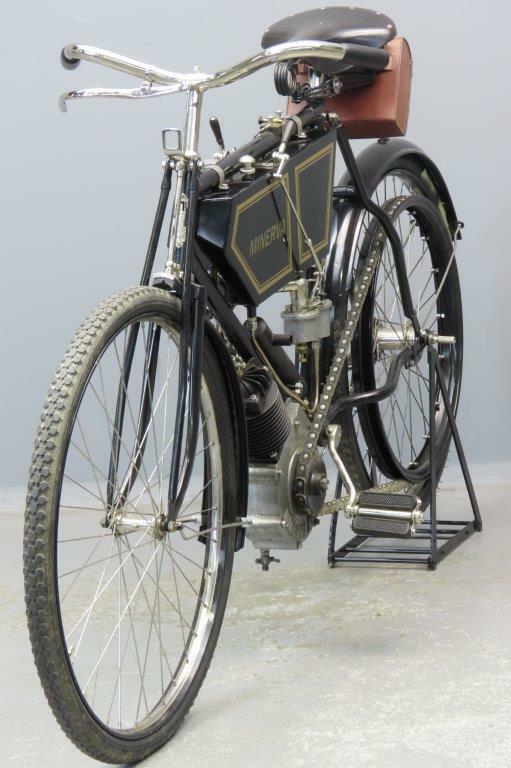 This 2HP has bore x stroke dimensions of 70×70 mm and is equipped with Longuemare spray carburettor. 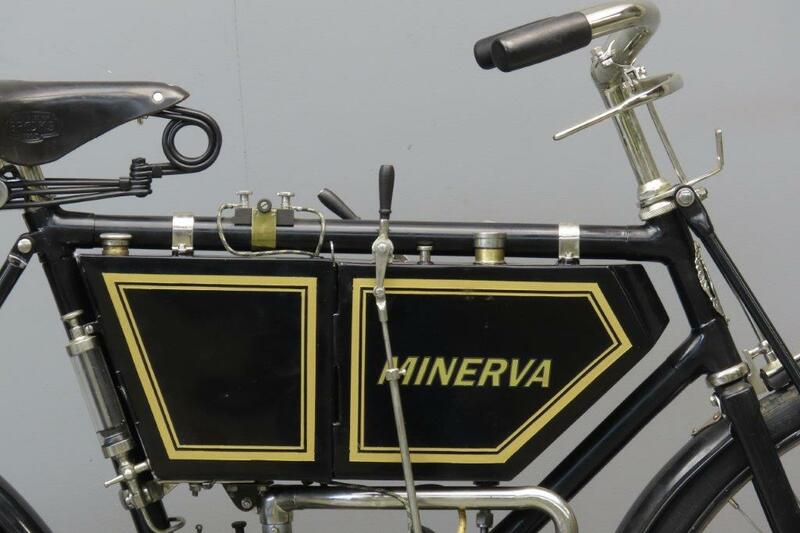 The veteran survivor was restored in the 90s and was part of the collection of a Minerva Specialist. 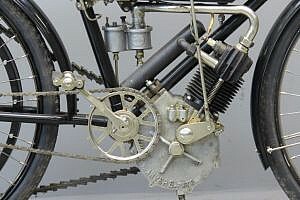 The machine is reported to be pretty powerful and runs well.